Ready to hang up your suit and goggles for the season? Here are 4 reasons to keep training through the winter. We believe the same is true for those who finish a Half IRONMAN or a triathlon. And if you’re like many of us, one triathlon or one IRONMAN isn’t enough. Soon after you cross the finish line, you start thinking about your next event. At the same time, you’re also looking forward to a long winter break. After all, it’s been a long, hard training season. 1. You Can Improve Your Technique and Base Aerobic Conditioning. Technique changes take time to learn, feel, and groove into natural habits. 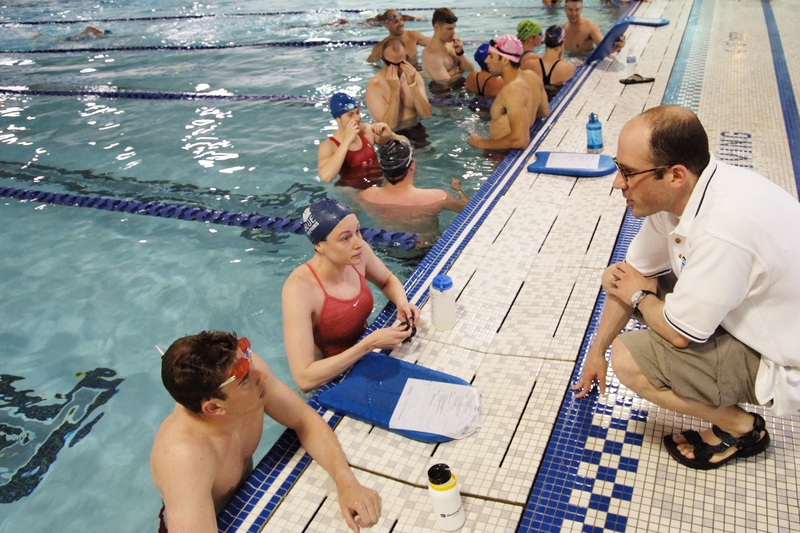 Without the pressure of getting in a training run or bike ride, you can break down your swim technique and spend more time doing drilling and exploratory easy swimming. Let us help you improve your technique with a Total Immersion Workshop or by having us videotape your stroke. If you use the fall and winter months to get the repetitions in, you’ll be ready to train with that improved stroke when spring arrives. 2. Nothing Gets You in Shape for Swimming or Makes You a Better Swimmer Than…Swimming. By continuing to get to the pool, you can build strength and aerobic fitness and improve your timing with the extra repetitions. While you might not have Olympic dreams, being consistent with your swimming efforts throughout the year will help you hit the goals you have set for yourself. 3. Swimming is Ideal Cross-Training for Runners. Swimming improves every muscle group in your body and is a zero-impact sport. When you run, you hit the ground with every stride. Comparatively, when you swim, you reduce the pressure on your back, hips, and ankles due to the buoyancy of the water. Marathon runners receive a needed break from the stress of running when they swim in the winter, and the change in motions makes their entire body stronger. Swimming also gives you the opportunity to control your breathing. When you are mindful of your breathing in the water, you can also control your breath when you run. 4. Learn a New Stroke. Did you know Major League Baseball (MLB) closer Aroldis Chapman makes $21 million per year? Not bad for throwing a baseball 1 inning per day for a few months.That is until you realize MLB starting pitcher Clayton Kershaw makes $35 million per year. Both pitchers throw a mean fastball. Why is Kershaw making $14 million dollars more per year? Because he also developed his Slider and Curve. Great starting pitchers need to rely on more than just one pitch. They need an arsenal to get them through inning after inning. The same is true for swimmers. Don’t just learn to freestyle swim. Also study the backstroke, breaststroke, and butterfly. Each of them will help you understand how the water moves around your body as you glide through the water. Working on other swimming strokes also helps you avoid repetitive motion injuries and strengthens other muscles in your body. We know you don’t have time to learn new strokes during racing season. But training in the fall and winter gives you a chance to do just that. While swimming is only one component of an IRONMAN or triathlon, we believe it’s the one that offers you the biggest opportunity for improvement. If you can swim efficiently, you’ll have more energy left for biking and running. Ready to train this winter? Talk to our team today about how we can help you: 773-342-7250.